September 28, 2009 - Mac Mellor writing - [According to the 1960 Tent List] Group 2 = Tent 9, 1960. June 7, 2006 – Allen Farber writing –I stumbled across the Hyde Bay web-site, and it brought back wonderful memories. To add information about one of the tent groups, you were right that I am the kid on the far right. The year was 1960. Isn’t the boy on the far left Steve Hyde? Then of course there is Fred Gale next to Rusty. December 15, 2002 - John Mercer writing -- Well, Mac is definite, but I think he's definitely wrong. As decribed below, I think the councilor is Billy McEwan. December 15, 2002 - Mac Mellor writing -- Definitely Charlie Classen as councilor. December 10, 2002 - Fred Gale writing -- Yup. December 9, 2002 - John Mercer writing -- Was the kid on the right end named Farber? John Mercer writing -- It wasn't my tent, Rusty, but it sure doesn't look like Charlie Classen; I'd guess that the councilor is Billy McEwan. Rusty Pickett writing -- Tent 8, 1959, ?, Fred Gale, Rusty Pickett, Charlie Classen?,?,? . 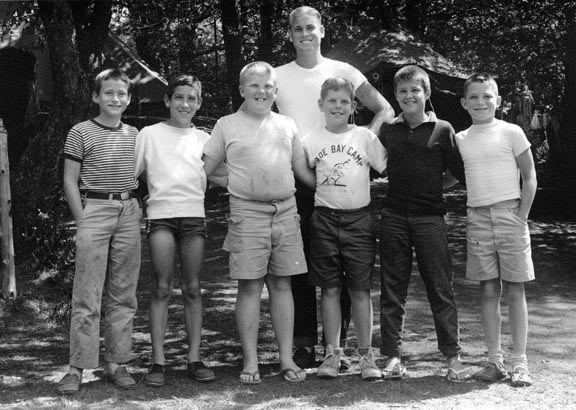 Left to right: Steve Hyde?, Fred Gale, Rusty Picket, Billy McEwan, _______, _______, Allen Farber.